What is the Best Way to Light up a Building with Colors? For a quick, non-invasive approach to lighting up a building, nothing beats a commercial projector. The practice involves committing to a design, which can range in complexity, from light color streaks to animated images, and projecting the visuals on the building using a projector. Meticulous installation is not required and costs are kept to a minimum (your main investment is the commercial projector). This option is ideal for short-term lighting needs and on-the-fly lighting requests. With a design ready, a small crew can deploy a colorful array of colors on a building in less than an hour. Unfortunately, commercial projectors are not suitable for long-term lighting solutions because the bulbs inside the machines do not last long (depending on the model and type of bulb, ranges between 500 to 1,500 hours). Furthermore, if the system fails the visuals or images will be removed from the building. Obstructions from pedestrians and outdoor light sources are also common and may affect the projector’s efficiency. An operator is also needed to monitor the projector to ensure it is working properly at all times. The most reliable way to light up a building with colors is the application of outdoor lighting systems. 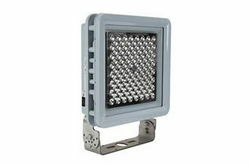 Floodlights, wall pack fixtures and spotlights are common luminaries used for this purpose. For a cutting-edge approach, businesses could utilize RGB LED bulbs and lamps, which are capable of emitting over 16.7 million combinations of colors. Compared to a commercial projector, this option is ideal for long-term lighting requirements. From a cost perspective (and depending on how elaborate one’s lighting needs are for the project), setting up an outdoor lighting system can be costly. To ensure reliable performance, individuals will have to consider investing in waterproof lights, or even explosion proof fixtures if the surrounding area is hazardous (volatile, ignitable compounds are present). However, out of all the lighting options mentioned in this article, an outdoor lighting system is the most versatile due to the wide selection of lights available in the market today. An innovative solution to outdoor, colorful building light displays includes the installation of bright luminaries inside the facility. For maximum clarity, the fixtures should be installed near windows and transparent panels with the lights pointing outwards. This method is ideal for buildings with large windows and easy-to-see surfaces. Filters, including colored gels and sheets, may be applied to the windows and/or fixtures when customizing the color of the light beams. This method comes with several limitations that may be difficult to address without incorporating the other two options above. Naturally, one is limited to only lighting up windows and transparent panels. Other non-transparent surfaces, such as walls, cannot be lit up using this technique. For a complete lighting solution, it would be possible to use outdoor luminaries to light up bare sections of the building. Lastly, rooms that are hosting the fixtures may not be suitable to facilitate ongoing business operations. Therefore, this option is only suitable for buildings that do not operate at night.